Because what I do is significantly different from a traditional “riding instructor”, it has been suggested that I write an article detailing what happens when someone calls to book me for a session. I have found that generally if one person asks a question, several more are thinking it! So here is a bit of information about what happens from the moment you pick up the phone. When I get a call from someone, the first thing I do is evaluate their situation. 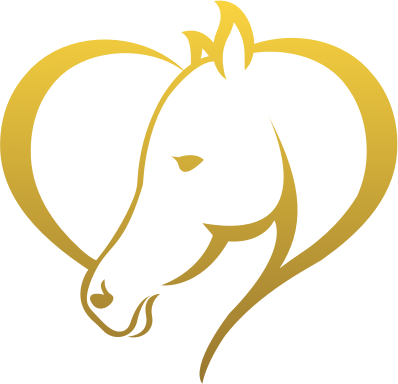 How old is their horse or pony and is it a mare, gelding or stallion. Is it broke to ride, handled or un-touched. What behaviour, if any, would they like to see changed. What are their goals or aspirations with their horse, and where would they like to be in a years time. Next I need to work out the best place to work with them. I stopped working in muddy fields and paddocks, as I have found it much to dangerous for me and the horse. So access to a fenced in, dry, flat area is essential. 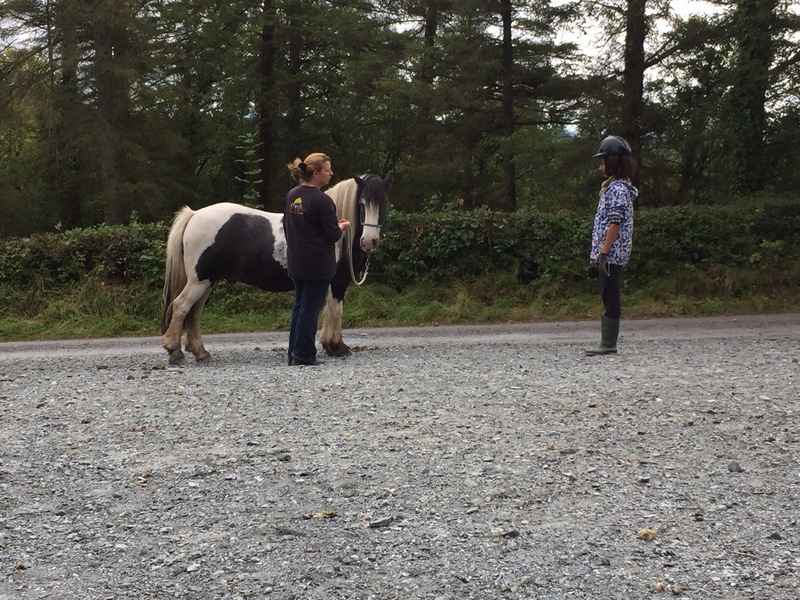 Do they have access to an arena or round pen, and if not, can they bring the horse to one of the facilities I work out of in South Leitrim. If they have access to a sand arena, where are they based, and we make arrangements to book a session. From the moment I arrive, I am working. I am watching everything the horse and their owner do. I am constantly making mental notes and observations. Is the horse paying attention to their handler or the outside world, is the head high, ears pricked or are they relaxed. Does the owner seem nervous maybe holding the lead rope at the clip. Im always watching. Always for the first session, I work with the horse. I need to evaluate him or her for instinctual habits and behaviour. Generally the first thing I do is switch the standard head collar and lead rope for a rope halter and 12ft lead rope. These items are essential if you plan on incorporating ground work into your routine. For information on why a rope halter is the preferred piece of equipment, please see my article on rope halters here. Next I see how well the horse leads. Does he lead? Does he barge ahead? Try to run me over? What happens if I correct him? Does he rear? Try to run away? Is he paying any attention to me at all? So much can be learned from the simple act of leading. Again I file away the information. The next step is assuring my safety. This requires that the horse learns to back up and maintain some distance. This can be quite difficult for many horses. They like to crowd us, and it is very important that this habit is broken. While I am teaching this, I am evaluating and observing. Does the horse want to fly back, or run forward. Is he crooked or straight, is he looking at me or other things, can he stand at a distance or does he want to creep forward. Sometimes there is rearing, sometimes they try to run off. Once I have established my safety net, and I can keep the horse at a distance for at least a few seconds, I move on. 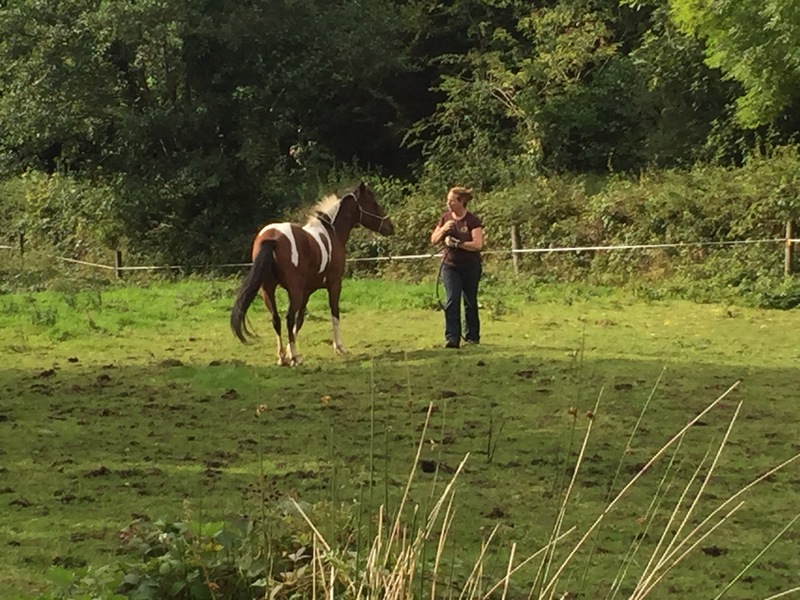 The next step is checking the horse for any signs if pain. I check the back, neck, hips and pick up the feet (if possible). Then I check for anywhere they don’t want touched. Face, ears, legs, belly, under the tail. This will give me indicators of temperament, and warn me of any kicking or biting. 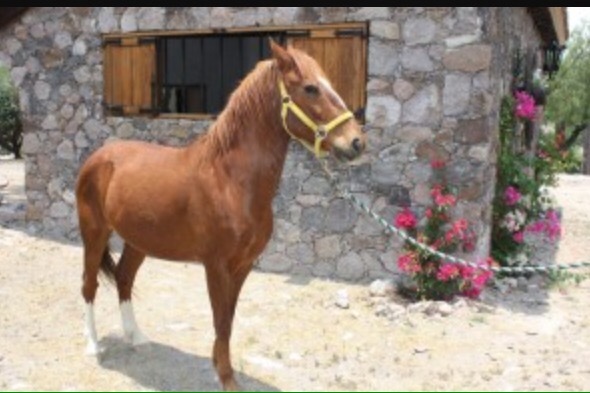 Once I have established the horse has no painful areas, we move on. We go back to creating a safe working space. I am setting the horse up for his owner. 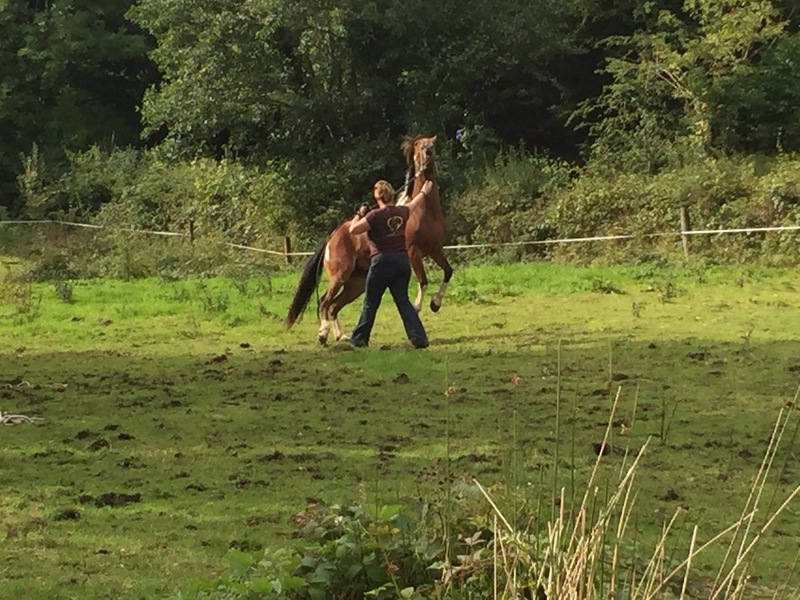 In most situations, this ground work is completely new to the horse and his owner. One of the two has to have at least a small understanding of what is expected. 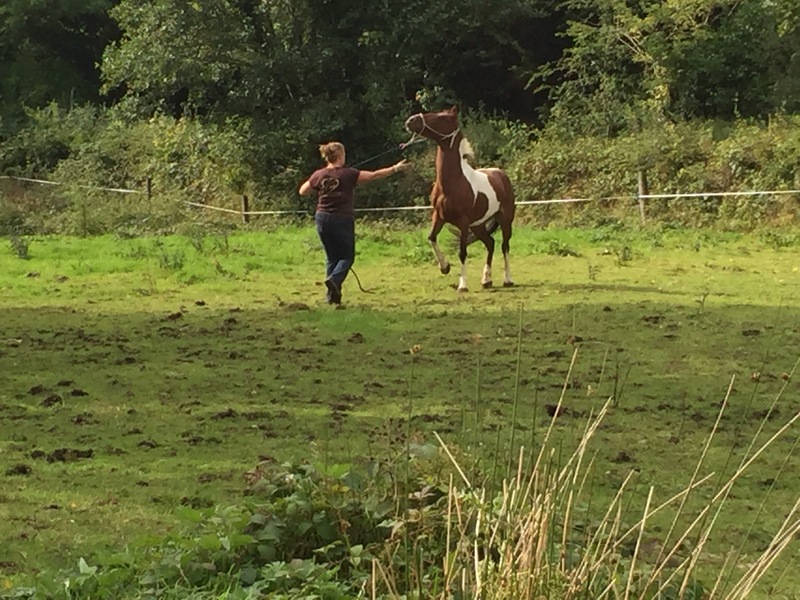 In every situation I am working to teach the horse, so he can be forgiving with his owner. This work is natural to the horse, but he just doesn’t realise a human can do it. His understanding is with other horses. So I get him to realise we can be like a horse. At first they don’t really like it. It takes their power away. They think they like being in control. But generally they don’t. In most cases being in control makes them nervous and unconfident. The horse is so much easier taught then the human, so this is where I begin. Then when the owner fumbles with their rope, has poor body language, is out of position, and has poor timing, the horse is forgiving. He thinks, I know what your trying to do, because that other human taught me that. He thinks, your not as good, but I really appreciate the effort! So I start to teach the horse. As many people know, I have a strong background in the Parelli system, and I still use a lot of his techniques, especially in the beginning. However I dig deeper to get faster results. I teach the horse to go out on the circle, and work on change of direction. Im looking for where his attention is, is he lazy or wants to run. Is he heavy in my hands? Trying to kick at me? Rearing through the change of direction? At this point I am still evaluating the horse. I haven’t really pushed him, unless he resisted. Its not time for pushing yet, I’m still creating my safety net. Initially my changes of direction are coming from front. Im trying to see how heavy the front end is, and see how forward or backward the horse is. Next I change to disengaging the hind end. Im looking to see if the horse is stepping forward or backwards through the movement. 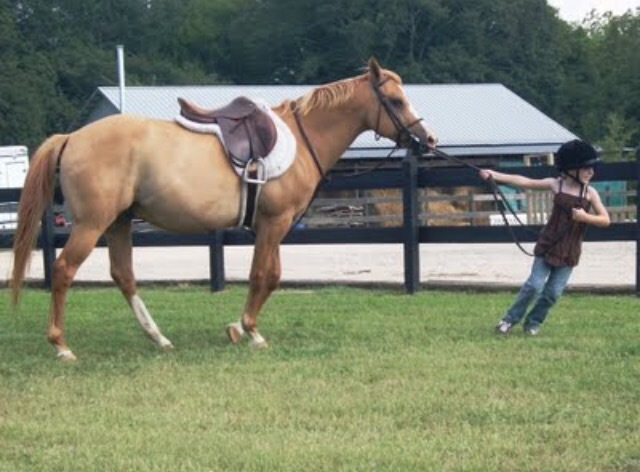 Im also always gauging how one sided the horse is. Im expecting that he is starting to pay more attention to me. Starting to think, “hrmm”. At this point I have a pretty good feel for the horse. I’ve created a situation where he can go out on his circle, and regardless of what he does, I am safely in the centre, away from rearing and kicking. Now it is time to push and see what I get. I always say, people want a nice relationship with their horse. They avoid the arguments. 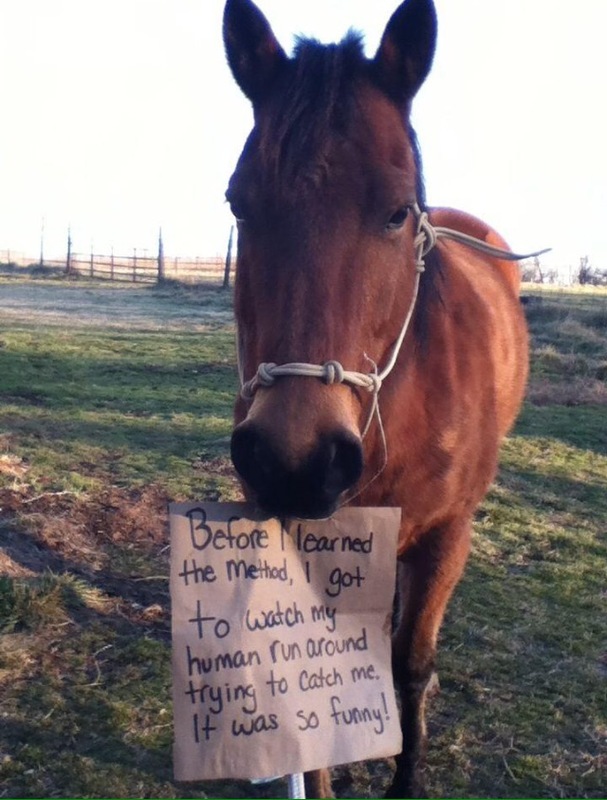 Of course the horse knows this, they aren’t stupid. They are like toddlers, always trying to get a little more (or likely do a little less!). I have the arguments the owners don’t want to have. I face the issue head on, and sort it out. My husband and I joke, I am the super nanny of horses, but its no joke! So everything up to this point has prepared me to start addressing issues. Things tend to get big and fast. Up to this point I have been explaining everything to the owner. Everything I find, I vocalise so they can see what needs fixed. A hind foot moving back, showing a desire to escape, keeping me in one particular eye, maybe kicking out on one side but not the other, perhaps rearing when asked for a change of direction. When the attention drifts, when they even think about letting the attention drift. Im pointing all this out, explaining it as I work. But now, I get quiet. Its time to go inside myself and inside the horses head. Things get big and fast. I have to concentrate to stay safe. This is when I start pulling the thorns out. The owner can see things happening, and generally start realise they could have never done it alone. I would love to tell you exactly what I do at this point, but its always different. Its always exactly what each horse needs. What I am doing is changing the horse. Making the desire to run become the desire to stay, the thought of backwards become the thought of forwards, lack of attention becomes attentive. Heavy pulling becomes lightness. Disrespect becomes respect. At the end of this time, both me and the horse are tired. He is now following me like a puppy. Head down, 100% attention. I now own him. Now is the owners turn. Only briefly, the horse is spent, and to much more will make him start to resist. 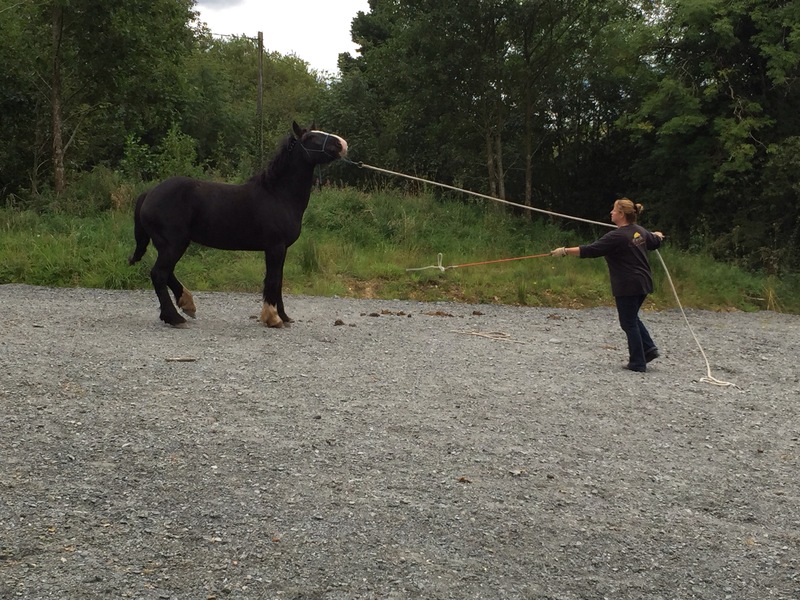 The owner learns how to use the ropes, to back the horse, to circle the horse, to keep his attention. To change directions. I look for things the horse is doing that the owner may not be noticing. Usually things like creeping forward after a backup or making the circle to small. Usually there is a lot of licking and chewing as the horse sees their owner in a new light. Then we are done. I give the owner things to work on, what to watch for. Now, this would be a typical first session for a broke horse, with or without problems, or a well handled unbroken horse. Subsequent sessions will involve the owner doing more, while I do less. Only stepping in to introduce more advanced techniques or correcting a problem that arises through the course of time. Untouched horses would go a bit differently, and would most likely require multiple sessions to be considered “safely handleable”. Horses with extreme problems would probably require more then one session to achieve the above ending result, however the owner would see significant changes after 1 session. Most minor problems such as issues lifting feet, bad leading, napping and aggression melt away pretty quickly, however it does require the owner to keep up the work after I leave. If you don’t change, your horse won’t change. I always make myself available by phone for follow up questions and advice, and go home feeling warm and fuzzy inside for giving one more person the gift of communication with their horse. Always remember, respect creates obedience, which breeds trust, which turns into calmness, in that order. You lose one, you lose them all. Of course this is only the first part of that puzzle, but it is the starting point to create respect and obedience. Once those are established, you add the elements of time, patience, and persistence and the rest of the puzzle begins to come together. They don’t call it a journey for nothing! Why Use a Rope Halter?